Over the course of a year, Works Applications Co., Ltd., Battanation Co., Ltd., and Loftwork Inc. worked together to create "Barista", a space that proposes a new way of working. One month after "Barista" opened, Nobuhiro Toyota, who was in charge of steering the project at WAP, Hiroko Yagi, who heads a wide variety of tasks including the operation of "Barista", Hitoshi and Takashi Iwasawa from Battanation Co., Ltd., and Yukako Ishikawa from Loftwork Inc. gathered at the space they had created and looked back over the project. What is a "magnet spot" that vitalizes intra-office communication? ── What was the background for starting this project? 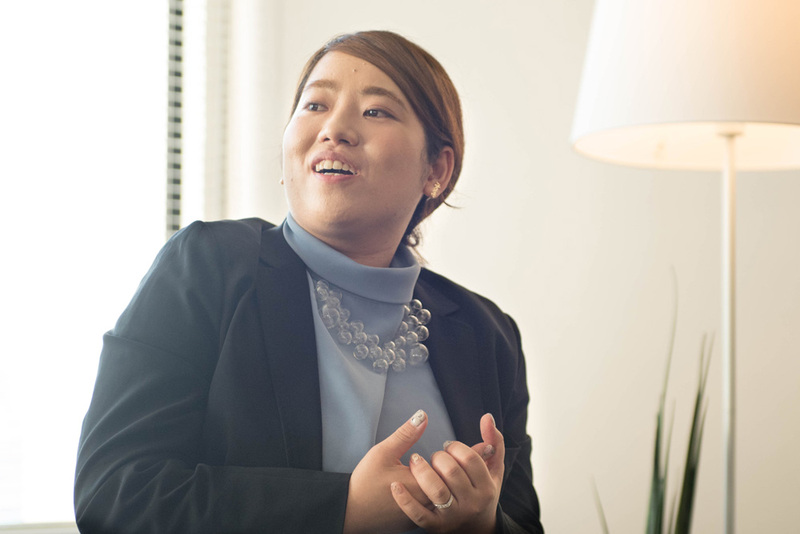 Toyota (WAP) : This might be rare, but our company encourages casual chats during work, and our work culture prefers people to be excited and bustling around. When we had fewer employees, all of the product managers were on one floor, so everyone knew where everyone was sitting and what kind of work they were tasked with. There was a lot of casual communication where employees would stand around talking or go out to cafes together to have discussions. 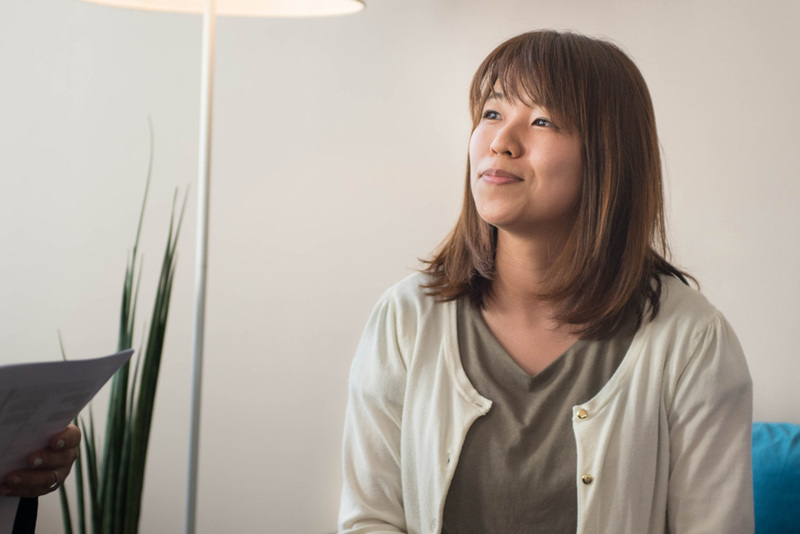 However, our workload suddenly exploded, and as the number of employees at our Tokyo office surpassed 3000 we felt that culture progressively disappear. It was during that time that the topic was brought up about whether there were costs to this loss of communication. As we grow as an organization, the physical distances between the teams “next door” to each other become wider. When that happens, communication in the form of casual conversation naturally decreases. ── I see. There must be a lot of companies that think about the nature of intra-office communication as their employees increase and the size of their businesses expands. Ishikawa (LW) : As we had discussed in earlier hearings, we wanted to create a space and system that would promote reinvigorated communication. In particular, the thing that Mr. Toyota and our CEO Mr. Makino focused in on was the “smoking area.” Smoking areas bring people together and are functionally a type of “magnet spot”, and the communication that is created in those areas is a surprisingly important element in getting work done. The point of the project was to use “smoking areas” as inspiration for figuring out how to make a space that attracts people – how to make a magnet spot. Toyota (WAP) : That’s right. You know how you can get all kinds of information from smoking areas? I’ve always been interested in that functionality. I thought, what kind of forms could we imagine if we tried to make a place with the same functionality for people who don’t smoke? 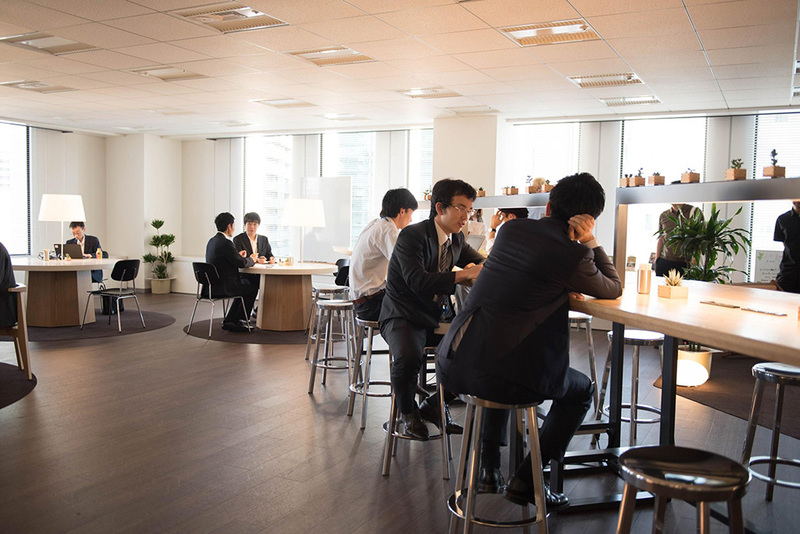 A space created to fit to a variety of working styles, and the attracting role of "coffee"
── Having taken on this problem at WAP of intra-office communication, how did Loftwork Inc. and the the two of you from Battanation Co., Ltd. approach beginning the space creation process? Ishikawa : We visited the office in person and researched for several months how the working areas were used and how the employees were communicating. The research consisted of behavioral observation of the employees and personal interviews using sensing technologies. We singled out the points people would like to improve on and the problems in the current working system while conducting interviews with people who have a large variety of characteristics. Hitoshi Iwasawa (Battanation Co., Ltd.) : We went to the office ourselves and carefully observed each floor. We went floor to floor, using a seating chart to see which people were doing what kind of work in which area. While doing that, we compared the impressions we got, the atmosphere, and the functionality of each floor with our own personal images. “This is an area with a lot of conversation”, “this is an area where people gather to work quietly” – the working styles were completely different from floor to floor, so we extracted out the points that might become elements in the space we were making. Ishikawa : Several issues came to light as we observed the working styles over a long period of time. One of those was something that Mr. Toyota and the others originally designated as an issue, which is that the organizational units are extensively broken up into groups and teams, and the larger they get, the harder it is for communication to arise from proximity or small run-ins. Takashi Iwasawa (Battanation Co., Ltd.) : At first, we wanted to reinvigorate communication by changing the layout of the whole working space. We were thinking of a design that would purposefully create magnet spots both inside and outside of the workspaces by arranging the islands of people separated by team or assigned product with human traffic lines and partitions. However, as we continued our research with the Loftwork members, we realized that working styles and job content varied among employees, and that because working times are flexible, employees’ core working hours are also completely different. That’s when we realized that the communication problem wouldn’t be solved just by improving the layout of the floors. As a result, we went with a plan to create a space that would place a magnet spot outside of the working space and, by gathering people together, would facilitate communication between people from different floors. Ishikawa : Our research and interviews caused us to progressively shift to creating a space and functionality that could vitalize communication more deeply and in a shorter time, based on the idea of creating a space that covers all working hours from opening to closing. Focusing on the element of “in a short time,” this meant creating a space where people could communicate casually and work for a short period of time either as individuals or in groups. The project members finally came to a consensus to create a space that would promote a variation in working styles. ── So, you made a space in a separate location from the working areas that permits a variety of different uses. And by doing that you created “Barista”, a place that brings people together and facilitates communication, just like a “smoking area.” The coffee counter also plays an important role, isn’t that right? 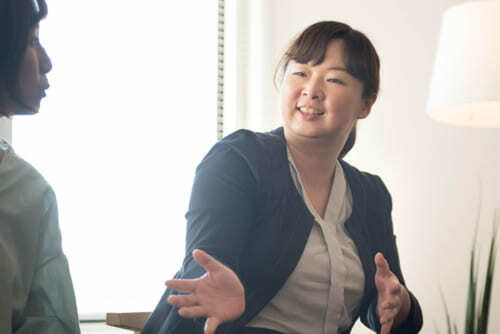 Ishikawa : The role of coffee is huge! We installed into the space a cafe management system that the Challenged Operation Center (COP), a department where employees with disability work, was originally in charge of. By making delicious coffee available at all times, the “Barista” coffee stand fulfills a very important role as a magnet spot that draws people together. Masuguchi (WAP) : The staff in charge take the job seriously and work very hard, as if it were a real cafe. I think they are increasingly conscious of making sure everyone has a good experience. 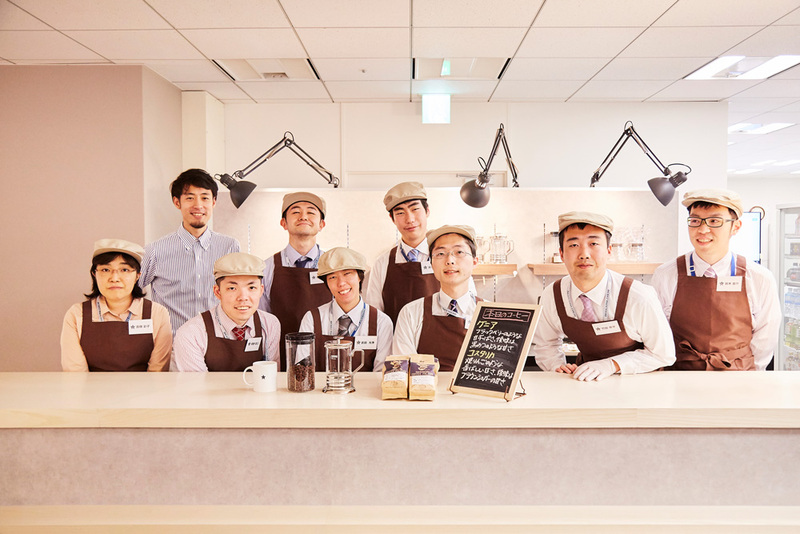 Kanawa (WAP) : Currently nearly 200 employees a day get coffee from “Barista.” The person who started the coffee program is a former WAP employee, Tetsu Kasuya (now a cafe consultant), who is also a world champion barista. We meet with him periodically to check on the taste and quality of the coffee. We’ve surveyed about 800 employees since opening, and over 90% responded that the coffee helps them re-energize. I’m happy that we’re serving such a positive role. How to create a space with "variation"
── It sounds like coffee is the draw, and that “Barista” has become a magnet spot for people to get together. What did you take into consideration in designing the space in order to promote casual communication and bring individuals/teams together? Hitoshi Iwasawa: One component was “height.” The sofa we’re sitting on now is at a low position, so you can relax and unwind for a long time. Conversely, high chairs are designed for concentrating for short periods of time, and are there for people to use while chatting or doing work. When people come into “Barista,” they probably already know what they want to do here (concentrate on work, talk with their friends, etc.) and choose their seats accordingly. This space was originally designed to have functionality that workspaces don’t have, and differentiating it by “height” makes it easier for people to make that choice. ── About a month has passed since the opening of “Barista”, how is the reaction of employees? Yagi (WAP) : The response from the employees has been very good. It’s so popular that most of the seats are usually full, especially in the afternoon. People are also using “Barista” in many different ways. Not just for taking breaks, chatting, and working – there are also employees who gather here and use the facilities at night like a kind of social club. Toyota : For example, over there (pointing to the back) a manager and their team members are freely chatting about development ideas. We’d like to use “Barista” as a starting point to progressively change intra-office communication. I hope we can continue coming up with new innovations for making physical spaces and systems that facilitate frequent communication. ── I’m excited for the future! Thank you for speaking with me today.